By now, most users are aware that malware targeting Mac® computers is an all-too-real threat. So let Webroot see to securing all your devices running on macOS®. Find the virus protection that is right for you. Compare all our products to find customized protection for you and all your macOS®-run devices. Banking, shopping and booking travel are a few of the many activities we engage in online that have the potential to expose sensitive information. Protect your usernames, account numbers, and other personal information from spyware, keyloggers, and other online threats. According to the FBI, phishing scams cost American businesses $500 million per year*, and data from Webroot suggests an average of just under 1.5 million new phishing sites are created each month. Block those behind fake support accounts, spambot comments, and phony emails from getting ahold of your personal information. Never get stuck staring at the screen as your Mac runs a scan. Webroot scans take about 20 seconds. That's up to 60x faster than competing products. Fast scans mean no interruptions, so you and your device won't be slowed down. Plus, cloud-based updates mean your internet security software is always up to date and on guard against the latest threats, without the wait. Webroot won't take up very much of your Macs storage space. 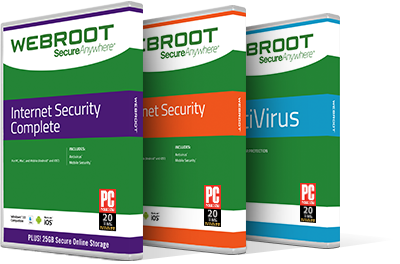 In fact, while the average antivirus software takes up 516MB of space, Webroot takes up only 15MB. That means there will be plenty of space left for the music, documents, photos and movies that make you love your Mac. We take the charge of protecting you online seriously. We recognize that important information like credit cards and other personal data is at stake. That's why we guarantee the real-time protection you deserve with a 70-day, no-questions-asked, money-back guarantee. Webroot's customer service is award-winning and 100% in-house, offering industry-leading support and product assistance. Support is Colorado-based and adheres to a "follow-the-sun" approach with offices spanning the globe from east to west, so there's someone there to assist you at any time, day or night.